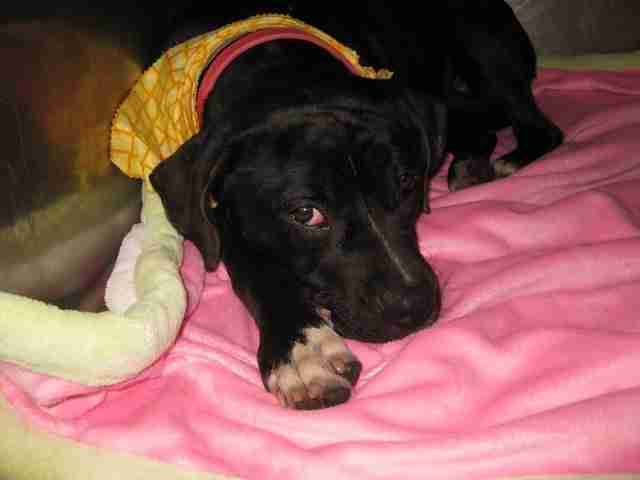 The veterinary staff knew the pit bull was scared by the way she cowered in her kennel, keeping her head down. But they didn't realize the extent of her fear until they tried taking her for a walk. As soon as they hooked a leash onto her collar, the dog flattened herself on the floor, refusing to move. The staff actually had to carry her outside. The warm sunshine should have cheered her up, but she still didn't perk up. 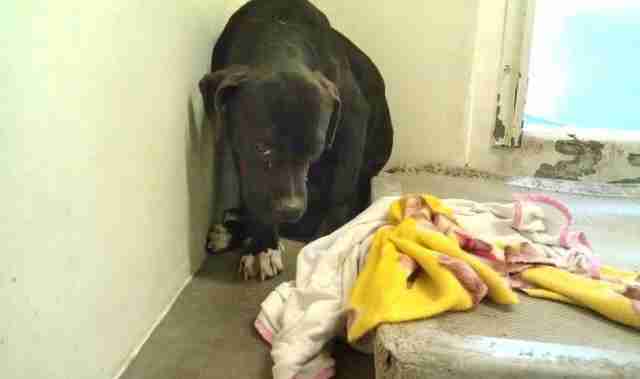 The terrified dog - who'd be named Roxy by her future family - had been picked up by animal control in downtown Los Angeles, after she was found hiding in the bushes. She was most likely abandoned and had been living on the streets for awhile. Whatever her story was, something had clearly traumatized her. 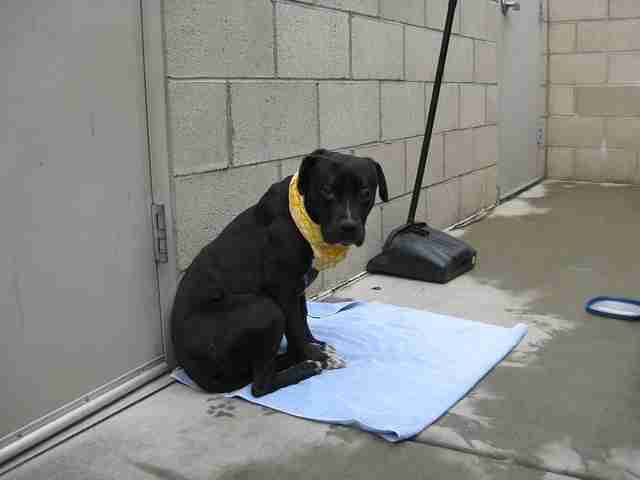 If Roxy had remained in the city pound, she probably would have been put down. Unfortunately, pit bulls tend to be the least adopted dogs, and over 200 pit bulls are euthanized every day in Los Angeles County alone. 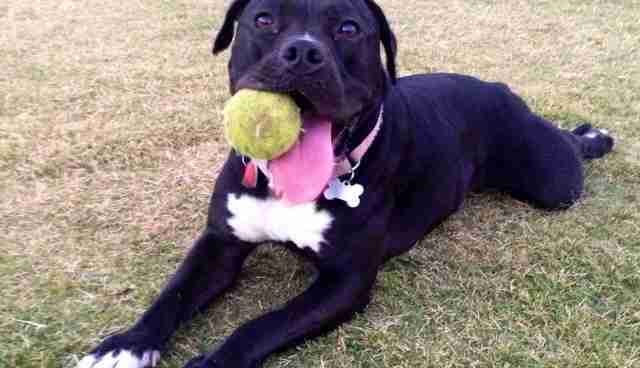 On top of that, Roxy was a black pit bull. In general, black dogs have a harder time getting adopted than dogs of other colors because of the negative portrayal of black pets in books, movies and other media, and because their facial features are harder to see in photographs. Roxy, however, was one of the lucky ones. 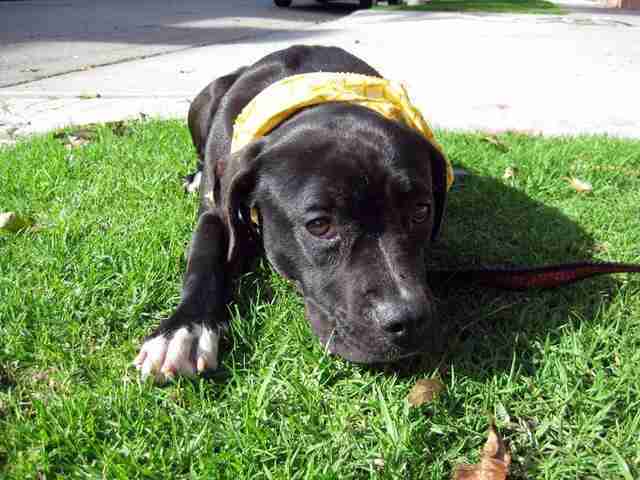 After spending nearly a month at the city pound, volunteers from Karma Rescue, a nonprofit group in Los Angeles, took Roxy into their care. Roxy was safe, but she still trembled for days in the veterinary clinic where she spent a week before moving in with a foster family. In fact, it was five days before Roxy even went for a walk. She might have stayed like that for a long time if it hadn't been for a cat. Not far from Roxy's kennel, a cat tiptoed across the window ledge of a veterinarian's office. 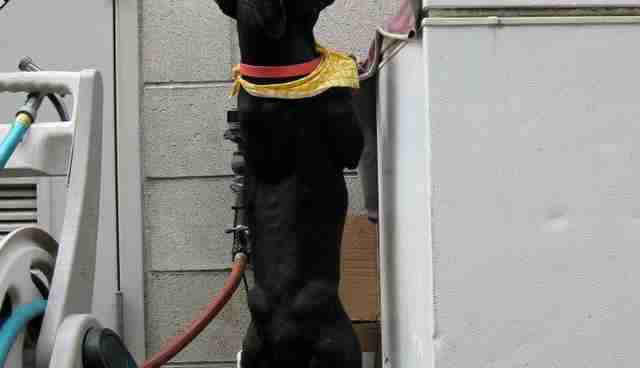 Roxy stood up and walked for the first time since arriving at the clinic. She wasn't investigating the cat in an I-want-to-chase-you kind of way - she appeared interested in a friendly way. Noticing Roxy's behavior, the veterinary staff set up a few monitored interactions between Roxy and the cat, who was a permanent resident at the vet hospital. 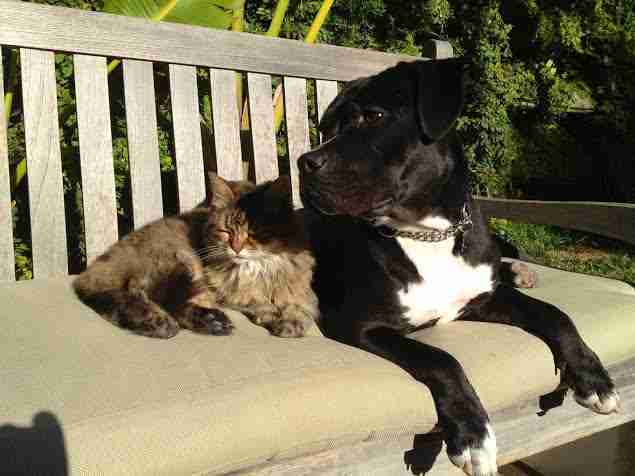 The meetings went so well, the Karma Rescue volunteers wrote "good with cats" on Roxy's online profile. It was these words that drew Sharra and Glenn Platt to Roxy's profile on the Karma Rescue website. The Platts had three cats at the time, as well as a 10-pound Pomeranian named Kasey who was very much an alpha dog, despite his small size. 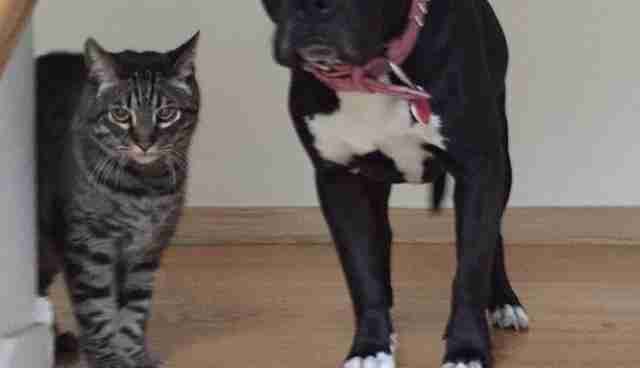 While neither Sharra nor Glenn viewed pit bulls as fighting dogs, they knew they had to be cautious when introducing any new dog into their family. 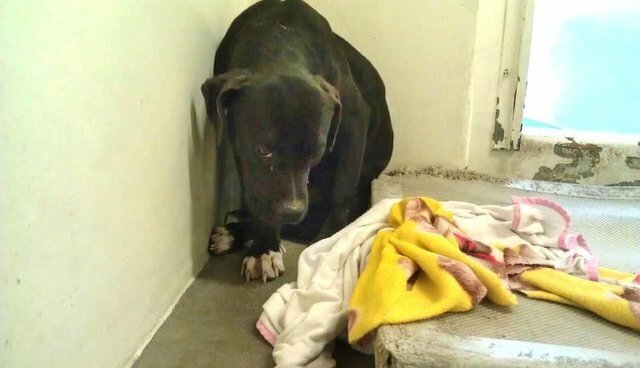 When Sharra contacted Karma Rescue about Roxy, the volunteers warned her about Roxy's fear issues. Instead of being intimidated, Sharra felt more determined. "There are issues I wouldn't feel comfortable taking on, but fear wasn't one of them," Sharra tells The Dodo. "I just knew, in my heart, that we could help her." Sharra and Glenn set up an initial meeting between Roxy and Kasey in a public park. At this point, Roxy was able to walk on a leash, but she was still pretty skittish. Despite Roxy's fears of the outdoors, the meeting between her and Kasey was successful. Not only did the dogs like each other, but Roxy submitted to Kasey's alpha authority. The Platts went on to coordinate a play date between Kasey and Roxy at their home in Malibu, and introduced Roxy to their cats. All of the animals got along, and the Platts decided to officially adopt Roxy. Things were looking up for Roxy, but her fear issues were still a big problem. "She didn't want to walk," Sharra says. "She would walk 20 feet, then flatten and freeze. Or she would pull like crazy on the leash and go back and forth in front of us. It was like walking a drunken freight train. Everything out in the world terrified her - trash cans, cars, trucks and the wind." Roxy was also afraid of things inside the house - strange lights, reflections and loud noises. The Platts enlisted the help of professional dog trainer, Manuel Hernandez, who helped the Platts help Roxy to get over her fear. "I think the most important thing Manuel told us was to not give her affection when she was showing fear," Sharra explains. "It's the one thing you want to do the most, but he drilled it into our heads that rewarding fear by giving affection actually encourages the fear. Our job was to encourage her to move through the fear, and praise her like crazy when she did." 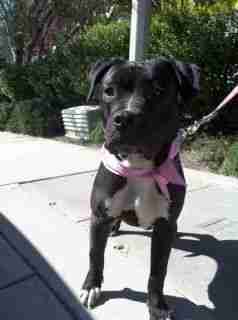 It took a long time, but Roxy eventually found the confidence to walk outside without fear. 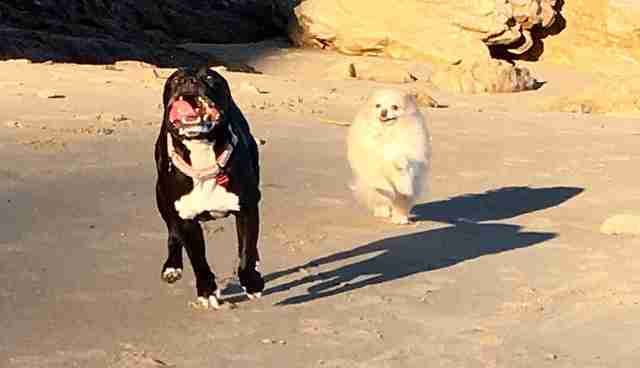 "Roxy was on a walk with my husband, and he sent me a picture of the dogs all the way at the end of the street," Sharra says. "It took him 45 minutes to get there. It's a half mile from out house, and usually takes 10 to 15 minutes. But it was progress." Each time Roxy went for a walk, she got further and further. 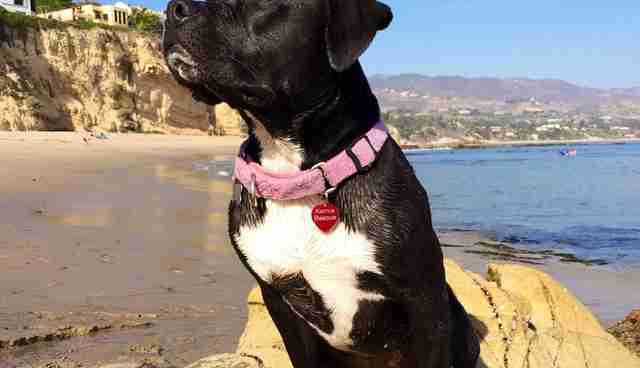 After about five months, Roxy made it all the way to Malibu Beach. 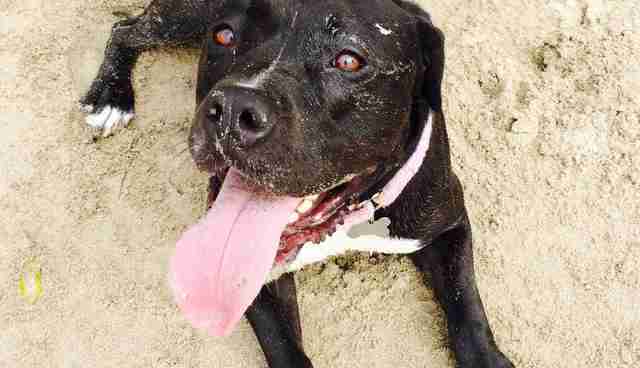 "Roxy didn't quite know what to make of the water but she certainly had fun running around in the sand," says Sharra. "She watched Kasey run into the water before she tried it herself. It was clear on that first day that Roxy was going to be a beach dog." 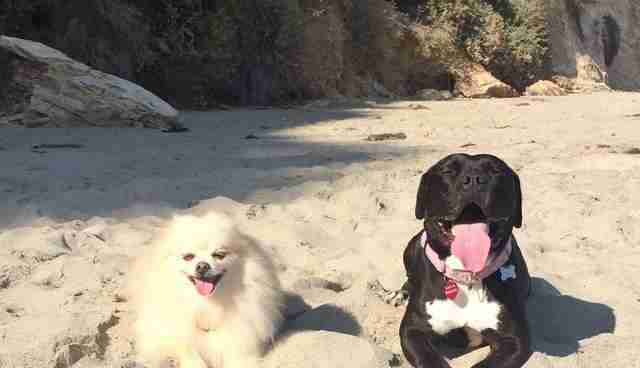 Now Roxy's life consists of daily walks, excursions to the dog park and of course, adventures at Malibu Beach. "She still has fear when we bring her to new places," says Sharra, "but it's nothing compared to what it was." 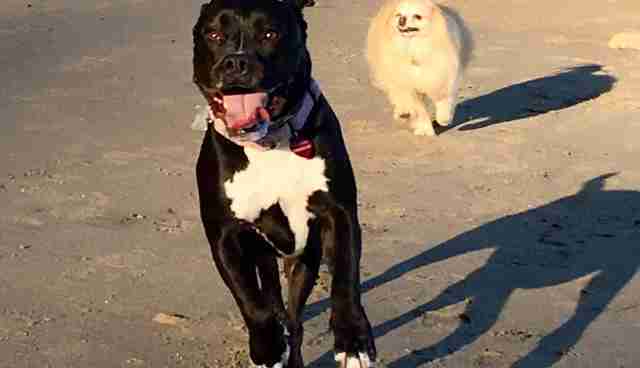 "Roxy is happy, healthy and the most loving, sweet dog I could ever imagine," says Sharra. "We are so blessed to have her as a part of our family, and look forward to many happy years with our Malibu Beach princess." 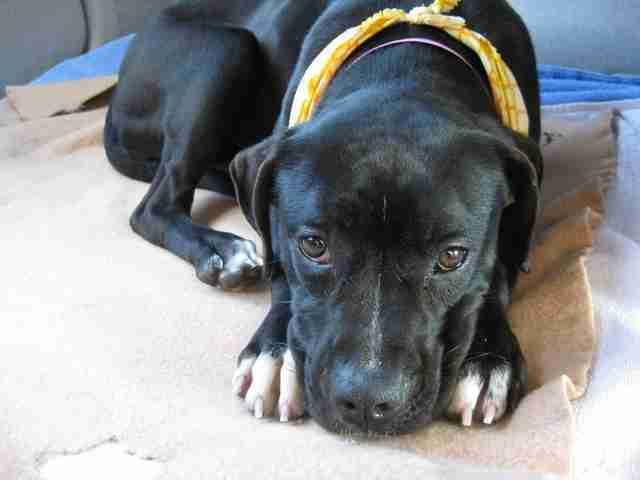 To help Karma Rescue save more animals like Roxy, you can donate here.